The award was given to the 4D InSpec XL for its utility and importance in making instant, qualifying, 3D measurements of surface features on manufactured parts being evaluated for use, rework, or scrap. 4D InSpec XL surpasses visual and fingernail methods with both 2.5-µm resolution, and a large 15 x 15 mm field of view. It measures features up to 9 mm in height, permitting a wide variety of feature inspection. It’s superior to optical profiling in price and convenience—and because it’s handheld and portable, it can run in battery-powered field and shop floor operation, on a benchtop, or attached to a robot arm. By providing better, faster measurements up to the specification limit, the gage increases yield—essential to increasing revenue and throughput for shops in industries dependent on processing quickly, efficiently and with high confidence. 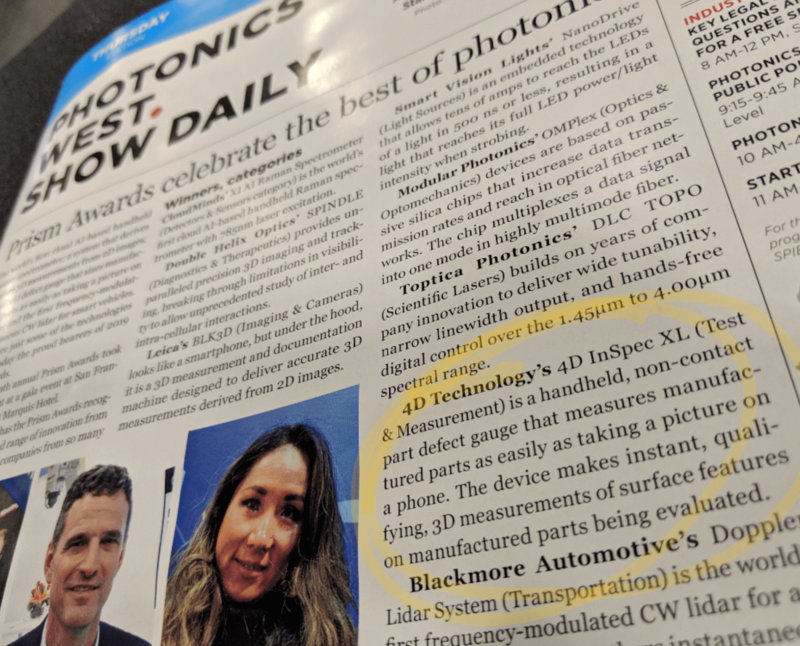 Congratulations to our creative engineering team members Neal Brock, Kramer Lindell, James Millerd, Erik Novak, and Joanna Schmit for shepherding this fine product from concept to the marketplace. We are grateful to SPIE’s Awards Committee for their careful consideration in a competition laden with many fine entries. And we’d also would like to extend our thanks to our parts manufacturing and maintenance customers—in Aerospace, Automotive and numerous other industries. They confirm the high value that 4D InSpec delivers in the most concrete form possible: by ordering (and reordering) the product. 4D InSpec XL was released to the market in 2018 and is currently being adopted in critical parts manufacturing and rework sectors such as aerospace, aviation and automotive manufacturing and MRO. The device provides instant qualification determination, measuring depth and height of features, radius of curvature, and verifying textures that are necessary to part acceptance. It measures features like rivets, pits, corrosion and wear on many materials, including metals, plastics and painted surfaces. The 4D InSpec XL joins the original 4D InSpec in the product’s family. It offers a larger field of view and depth of field as compared to the smaller, more agile, original. 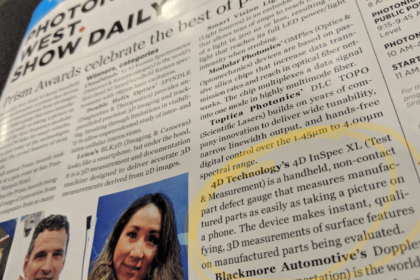 Both 4D InSpec gages are available worldwide through distributors and representatives of 4D Technology Corporation in the Americas, Europe, Asia and Australia, as well as directly, elsewhere.